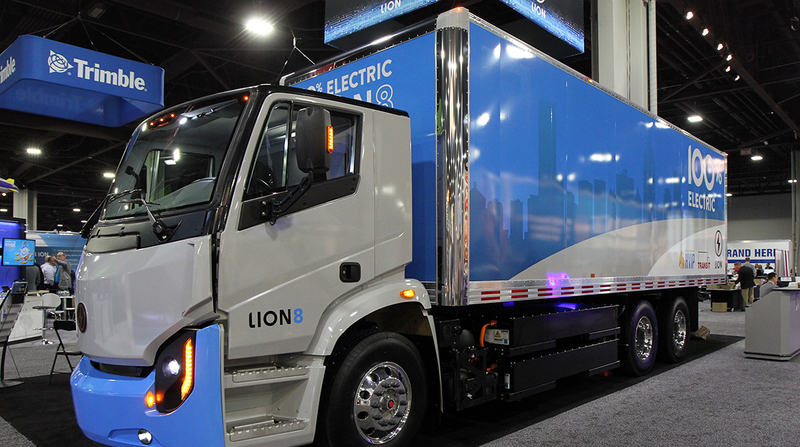 ATLANTA — The Lion Electric Co. wants to demystify electric commercial vehicles for its customers. Lion, a Canadian company, showcased its new Class 8 truck, the Lion8, at American Trucking Associations’ 2019 Technology & Maintenance Council annual meeting here. The battery-electric truck has a range up to 250 miles, which Bedard said is the distance 40% of the Class 8 trucks typically travel in a work cycle. The company expects its main customers will be fleets hauling dry freight or refrigerated commodities, he said. The Lion8 will go into production this fall. Other manufacturers produce electric trucks, he noted, but there are few such trucks on the road. The company launched its first electric bus in 2016 and has since deployed more than 200 zero-emission school buses in North America, with more than 2 million road-proven miles, according to Dana Inc., a key supplier to Lion. The Lion8 will include Dana’s TM4 Sumo HD direct-drive motor, BCI20 charger and inverter, the Neuro vehicle controller, and Spicer DS404 drive axles and SPL 250 driveshafts. “What we target is to get to 1,000 units in Class 8 as soon as possible,” he said. The orders came from three different fleets in Canada and the United States, he said. The first order came from Société des Alcools du Québec. The SAQ is a Crown corporation whose mandate is to trade in alcoholic beverages by offering a variety of products. Its sole shareholder is the Minister of Finance of Quebec. Meanwhile, Lion will use predictive technology to inform its customers of needed maintenance actions, Bedard said. “There is a diagnostic that the [customer] can see. We are supplying them with a lot of information, telling them ‘this or that’ could go wrong, perhaps, in a month. It covers over 100 items on the truck,” he said. At the same time, Lion is advising customers on the investment they will have to make to charge electric trucks on-site, and any grants available to offset the purchase cost — which could be $300,000, he said. “They are operating their fleets, they have no time for managing electric. We take care of that,” he said.